Everybody knows that Thomas Edison has invented electricity, which is not the truth. In fact, it was Benjamin Franklin who discovered the theory that lighting and electricity are similar to each other. But he didn’t invent energy, since energy cannot be created nor destroyed, just transformed. Thomas Edison built the first power plant in New York, which supplied electricity to 85 buildings in the year 1882. He was also responsible for the bulb which stayed more than a few seconds. He invented 2000 products including fuses, switches, sockets and meters and lit up million homes in the city. Eel fish can produce high electric shocks of around 500 volts for both hunting and self defense, but it doesn’t glow. The fireflies produce more efficient light than a light bulb, which they produce from the chemical energy of their food. Deep sea squid and glow worms also glow like fireflies. Playstation 3 consumes more energy than a refrigerator. The first and only country which relies on the renewable sources of electricity is Iceland. Each bolt of lightning has electricity that could supply energy to approximately 200 000 average size homes. During a hurricane, the heat energy released is 50 to 200 trillion watts, which equals 10 megaton nuclear bomb exploding in every 20 minutes. A normal spark of electricity measures about 3000 volts of energy. A bird sitting on a single power line will not be electrocuted, but if it touches the other power line with its wing or foot, it forms a circuit and it is electrocuted. A traditional bulb lights up with 10% energy and the rest of 90% is wasted as heat. The difference in the AC and DC current is due to the electrons, In DC electrons move straight and in AC electrons switch directions. Almost all of us have used google for searching, according to the stats google is responsible for 0.13% of energy use and which equals to supply electricity continuously to 200,000 homes. Energy used for 100 searches equals lighting a bulb for 28 minutes. Statue of liberty is the first lighthouse, which used electricity in 1886. Electricity also works on the principle of gravitational force, where electricity can attract and repulse also. The speed of electricity is 300 000 km per second, which is faster than any other thing in the world. if you lit a switch in your house to a bulb connected on the moon, you could go around the world 8 times, the time it takes you to light the bulb by just turning the switch on. Electrician in many parts of the worlds are termed as engineers. 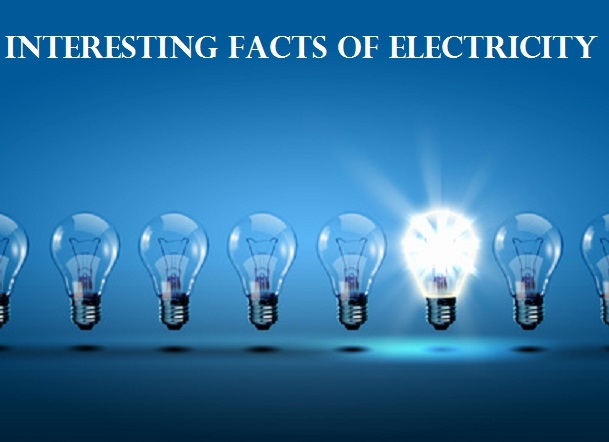 These facts are verified by a master emergency electrician of Sydney. Author-Bio: Am Uzma Sultana, an Engineering graduate and SEO Analyst by profession. Writing on multiple topics and blogging is my passion. I’ve been writing on web from past two years and as of now am working for a Digital Marketing Firm. Follow me on Google+ to read my quality articles.